• PLOT SUMMARY: "Earth Bound." Written by Geoff Johns & Alex Ross. Art by Dale Eaglesham, Jerry Ordway, Bob Wiacek & Nathan Massengill. 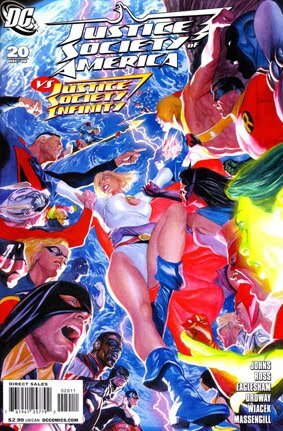 It's the Justice Society of America vs. the Justice Society Infinity of Earth-2 with the fate of Power Girl at the center of it all! Meanwhile, Starman struggles with his returned sanity as he embarks on his true mission in our time period - one that will have vital consequences for the Crisis of the 31st century!